As we start into the busy holiday season, it is so important to take a little extra time for just ourselves. What better way to relax and restore our minds and bodies than to take a nice hot bath? San Francisco Salt Company offers bath salts that will make taking your next bath a truly wonderful experience. I loved taking a bath using Muscle Soak mineral bath salt. If you've had a long hard day, treat yourself to the blend of Epson salt, eucalyptus and peppermint essential oils in your bath. The fragrant water will make you want to spend a long time in your tub, and this is the perfect answer to any tired or achy muscles. San Francisco Salt Company offers an extensive line of bath salts and bath products available in many different scents, colors and types. I think their prices are very reasonable for such a high quality and enjoyable bath salt. Any one of their beautifully packaged items would make a lovely Christmas gift, or a gift for any time of the year. The company's philosophy is all about harnessing the power of the ocean with mineral sea salts to enhance your well-being. Their mission is to raise customers' awareness of the amazing benefits of natural sea salts. 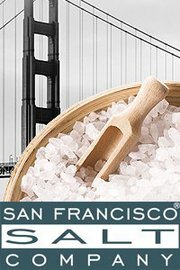 To learn more about San Francisco Salt Company and to view their products, visit their website at SFBSC.com. I like San Francisco salt co. on fb. I signed up for their newsletter! Thanks for entering me! I Like San Francisco Salt Company on Facebook (Stacie Dennis Frost). Thanks for entering me! I Follow San Francisco Salt Company on Twitter (@savingmama42). Thanks for entering me! I follow you on facebook (Stacie Dennis Frost) Thanks for entering me! I signed up for San Francisco Salt Company newsletter. I follow San Francisco Salt Company on Facebook under the username likwan. I follow San Francisco Salt Company on Twitter under the username likwan. I shared this giveaway on Facebook at http://www.facebook.com/likwan/posts/230583567014731. I tweeted the requested message on Twitter at https://twitter.com/#!/likwan/status/145777929211740161.